When first engaging with a Waldorf School we have to get used to the fact that the management structures that we encounter are not necessarily what we have come to know in other mainstream schools. Waldorf schools are often referred to in the world as ‘free’ and ‘independent’ schools, due to the nature of the way in which they organise themselves. Waldorf Schools may one day be regarded as one of the most significant initiatives of the twentieth century. They are dynamic educational impulses, now the fastest growing independent education movement in the world. However most Waldorf schools operate from a flat structure, where the striving for consensus is at the heart of every engagement that develops the school. New families need to take time to experience the function of this new form. Along with the two overarching management structures of the school, The College of Teachers and the Board of Trustees, all the day-to-day activities and operations are carried out by Administration, which is supported by Seven Action Groups/Mandates. At Stellenbosch Waldorf School, our organisation is viewed as a living system, identified in the form of a tree – in cross-section. Using the tree organism and the school’s list of mandates, the ‘CONNECTIVI’TREE became a pictorial representation of the school’s organisational activities and life. 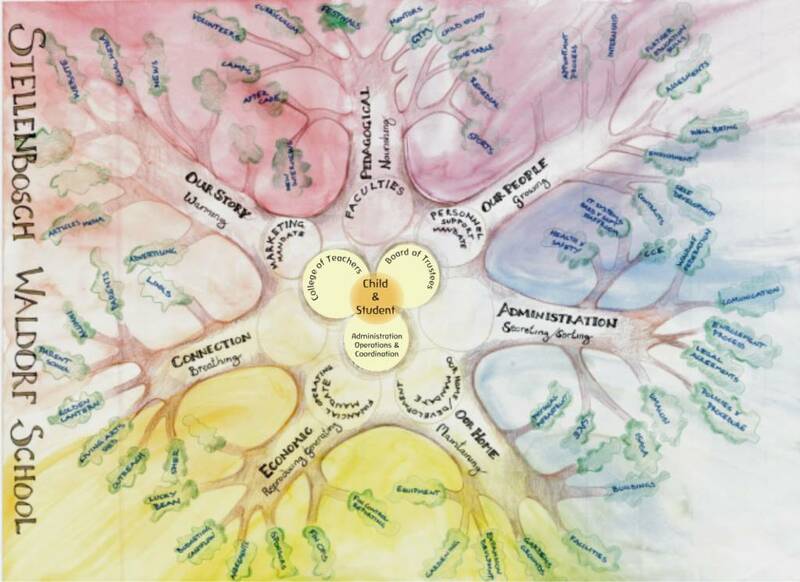 The ‘tree’ remains the informant for how we view and work with connectivity and our network with the child and student being the heartwood of the tree. This life giving, self-regulating image of the organization presents a framework in which individual strengths and interests can be liberated to contribute to our greater collective and interwoven organizational community. Thus supporting the metamorphosis of our organization. Bring life to the existing and possible roles and responsibilities for the greater community. Demystify structures, relationship of activities and people involved. Ensure that representatives are contactable and accountable. Almost more important than the groups themselves are the connections and relationships created between the groups. Without the connectivity a group can become isolated from the whole with neither benefitting nor nurturing the potential and opportunities for growth. All living things depend on a process and life divides into seven definite processes, which are represented as the 7 branches of the tree. 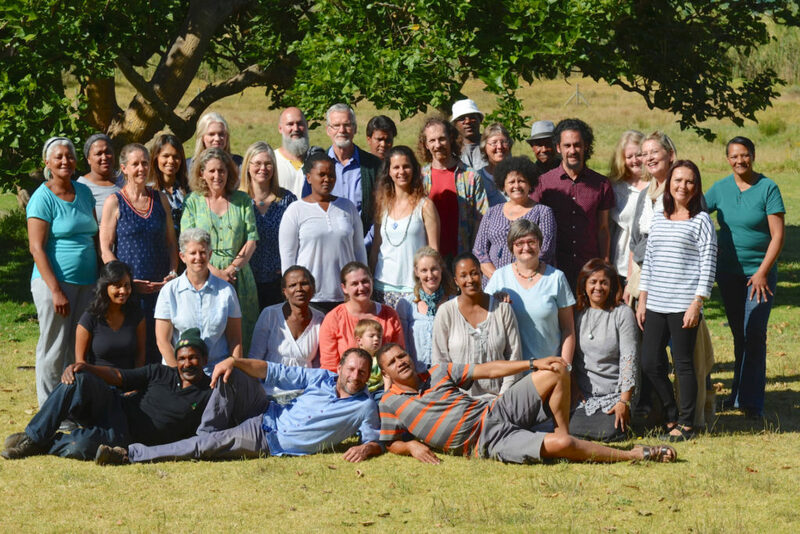 This life-affirming image, of our School presents a framework in which individual strengths and interests can be liberated to contribute to a collective and interwoven organisational community that supports the College of Teachers in their task of Waldorf Education. School Governance – Informed by Anthroposophy, The South African Federation of Waldorf Schools, WCED, ISASA, UMALUSI, SWS Trust Document, SWS Charter as well as the SWS policies and procedures. Regular reporting is done on a weekly, monthly, termly or annual basis to the relevant bodies. College of Teachers – Ultimately responsible for the pedagogical development and well-being of the School. All faculties (Kindergarten and Playgroup, Primary School, High School, Matric and Aftercare) are represented in the seven aspects which are brought to the weekly College of Teachers meetings. Board of Trustees – Guardian and overseeing role. Responsible for collaborative strategic thinking and direction. Meet monthly or when required. Work closely with the College of Teachers and report back at the annual general meeting. Admin Operation a Coordination– Connection point of the school. This function is pivotal in providing the operational administrative support to the 4 groups above as well as the Seven Aspects of the school. This core role is key to the wellbeing of this living system and reports to the College of Teachers and the Board of Trustees on a regular basis. Details of each group can be seen in the diagram. Each group meets regularly and some have more formalised managerial and reporting structures i.e. FINOPS (Economic), Administration and Pedagogical. Focus or Interest Groups – Out on the periphery of the tree is where the real opportunity for diversity and flexibility lives. A group that arises from an impulse, a need, a support requirement or a desire. These groups have a specific time frame (not ongoing) and become either operational groups or mandates or simply dissolve. These groups can be of a ‘project’ nature and they can include: new ventures, campaigns, research, administrative support, strategy, events or study groups. These groups are generally enlivened by the parent community. There is more information on the structure and management in the School Family Handbook.